Grinding for hour upon hour only to bubble in a poker tournament is quite a frustrating experience, but the time-based events at Americas Cardroom eliminate this problem. They’re set to start and end at a specific time, so you’ll know in advance the maximum amount of time you’ll have to devote to them. These unique competitions are actually a combination of cash game and tournament. They feature a designated starting time and increasing blinds, like tourneys do. However, the prize distribution is more akin to a regular ring game table: At the end of the contest, everyone still standing converts their chips into cash at a fixed exchange rate. There’s no late registration, re-entry, rebuys or add-ons here. The chips you get when you buy in are issued a single time, and they cannot be replenished. The main time-based event at ACR is known as The Cage. It costs $1,000 + $50 to enter and runs Wednesdays at 7:00 p.m. ET. Entrants get 1,000 chips, each of which is worth $1 and will be exchanged at this rate at the end of the tournament five hours after its start. For low-rollers, the Friday Playpen provides a similar experience. It only costs $10 + $0.50 to enter, and it lasts just one hour. Each of the starting 1,000 chips is worth a penny each. Five separate Playpen tournaments take place each Friday in the afternoon and evening. Join The Cage, the Playpen and whatever other interesting competitions catch your eye at Americas Cardroom by following the instructions contained in our bonus code page for Americas Cardroom. 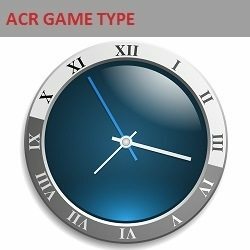 Time is passing you by – Become a member of ACR here!